I was looking for a solid corded phone (yes, corded) because I was tired of cordless phones whose batteries (not easy to find and not inexpensive either) would need to be replaced every couple of years. A home phone isn't something that you should need to replace every two years if you ask me. 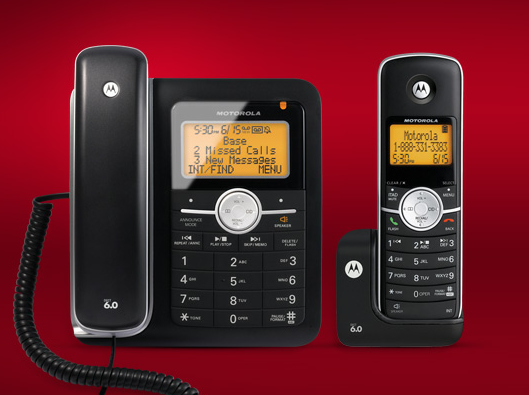 So I decided to invest in a decent phone and buy this good looking Motorola set: L402C DECT 6.0 Cordless/Corded Phones with Answering System. Everything was great at first. It's a phone with an answering machine; it just needs to work and it did...for awhile. The ring tone is way too loud for my taste (even on its lowest setting), but you can live with it. Fine. But, fast forward to today 18 months after purchase and the phone has suddenly developed this insane level of painful (as in hurts the ear) noisy static on phone calls. It's loud enough through the phone's speaker that the other person can hear it (I tried both the corded AND cordless phone). It's not the call connection, it's the phone itself (since trying out another phone has no such static). So of course the Motorola phone is out of warranty (1 year warranty), so I'm out of luck. It's a lesson for me to never buy a Motorola phone product again. I cannot in good conscience buy one of their cell phones either if their regular corded phones (a 19th century technology) becomes effectively useless after 18 months. The phone is working again, after giving it a "break" for about a month. Weird.